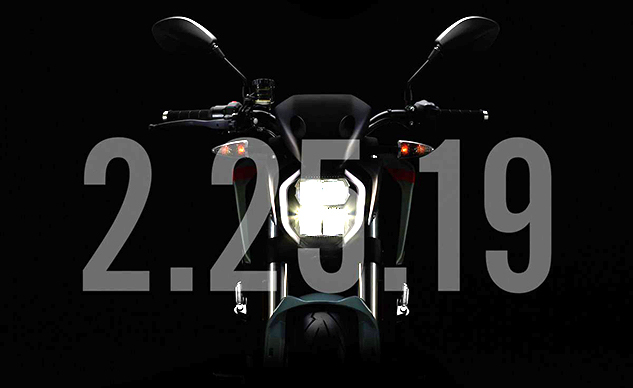 Zero Motorcycles is teasing a new SR/F model through its social media channels, promising full details to come on Feb. 25. While a new model is notable, the more important news is that the SR/F will introduce an entirely new platform that will eventually expand to include other future models. Over Twitter, Instagram, and Facebook, Zero shared a dimly-lit look at the front of the SR/F revealing a new headlight design. A short video on YouTube shows the lights coming on, revealing a stacked LED unit caressed by a pair of LED daytime running lights. Zero’s current lineup is based on a platform first introduced in 2013, with annual updates in the following years, mainly in improved battery capacity, fast charging, updated suspension and ABS brakes. In 2017, Zero applied its interior permanent magnet motor across its lineup, offering increased temperature thresholds and higher amperage motor controllers. Back in October, Zero announced its 2019 model lineup, with a focus on updates to its dual sport DS models. We now know Zero was preparing for a much more significant update to its street bikes coming, starting the SR/F. We surmise from Zero’s naming conventions the SR/F will be a successor to the SR, itself a higher spec version of the Zero S. Calling it a new platform, we expect Zero to announce a new powertrain and perhaps a new chassis as well. The teaser image shows new bodywork to either side of the headlight, while the handlebars appear to be slightly lower than on the current Zero SR. While some may be hoping for Zero to come out with a faired sportbike, Zero makes it very clear that the SR/F will be another naked bike (so no, the “F” doesn’t stand for “fairing”). That being said, we don’t know what future models will share the SR/F’s new platform, so those holding out hope for a electric sportbike may just have to wait a bit longer. This should be an important year for Zero, as it faces new competition in the Harley-Davidson LiveWire which is expected to be released in 2019. Zero has established itself as the leading American electric motorcycle manufacturer, but it can’t afford to rest on its laurels as an industry behemoth such Harley-Davidson plugs into the electric bike market. We’ll have more information about the new 2019 Zero SR/F as it becomes available leading up to its reveal on Feb. 25.